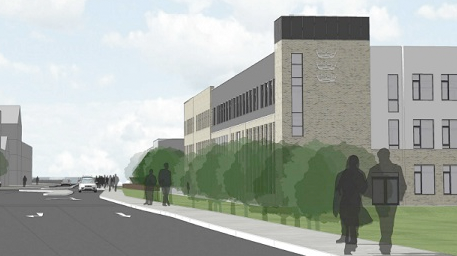 Planning permission has been granted for a new secondary school in Wichelstowe. Construction on the Deanery CE Academy will start in August with the school opening in September 2019 for year 7 pupils. The Deanery CE Academy will open in September 2019 for year 7 pupils only and will gradually increase its numbers each year as a new year 7 group is added. When the school is fully open there will be around 1400 students including approximately 400 sixth form students. The school will be run by the Diocese of Bristol Academies Trust and will allocate 50% of its places to children of the Christian Faith across the Borough. The school will include a Sport England standard multi-use games area as well as an all-weather pitch designed to Sport England hockey standards. An impressive theatre space also provides enhanced performing arts facilities. The site has been cleared ready for construction with the site set-up for the main works underway. The main construction contract will commence in mid-August 2017.